Tarte Cosmetics is EASILY one of my favorite cruelty free makeup brands, if not my ULTIMATE favorite. One thing I had never tried from Tarte are the eyeshadows because I’ve always used other brands. Now I have to say I’m a convert for sure! 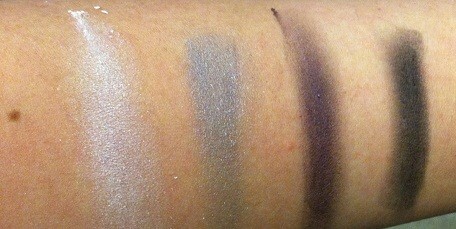 The Envoke Smoke eyeshadow quad (part of the Miracle of Maracuja set from QVC) is ah-maze-ing! 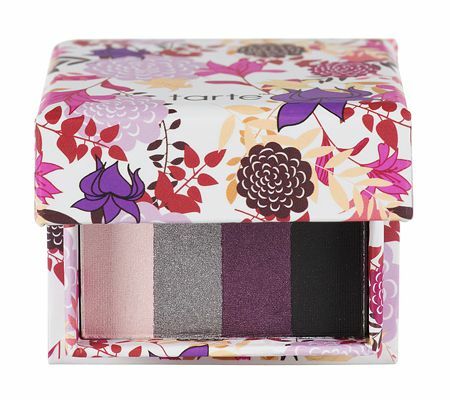 The packaging for Tarte’s Envoke palette hits the vintage Victorian look with a more modern feel. The Envoke quad is very pretty on the skin and easy to apply; the colors are gorgeous and in my opinion good for all skin tones. The four colors included in the quad are Pink Cloud, Silver Mist, Purple Fog and Dark Ash. When I paired the Pink Cloud and Purple Fog I chose to use the Pink Cloud as a highlighter because it’s so sheer compared to the other three colors and easily usable with them all as well. I also am a fan of Tarte’s eyeliners and am currently using the Cashmere Waterproof Gliding Liner. The Gliding liner is a retractable eyeliner that goes on smoothly and doesn’t run. I personally love the cat eye (winged) look and therefore use gel or liquid liners more often. I only wear pencil liners on the water line to define the eye more, but I found it very easy to do the cat eye look with Tarte’s gliding liner, because as the name states, it easily glides on and there is no tugging or reapplying necessary, unless you want to do a thicker line. « What’s on Visionary Beauty’s Dressing Table? The packaging is so cute!!!! !